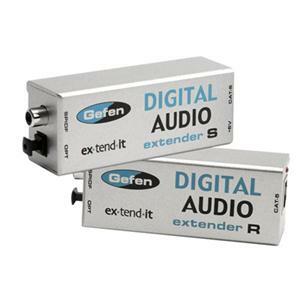 Place your digital audio components anywhere you want with Gefen's Digital Audio Extender. It supports either S/PDIF or TOSlink digital audio signals, which are commonly used to transmit stereo and multichannel (5.1, DTS, Dolby Digital, etc.) digital audio among various components. The Digital Audio Extender uses a sender and receiver system connected by CAT-5E cables to extend the digital audio.